What are Caddytips? Caddytips are downloadable Adobe PDF files that help a golfer learn how to play the course listed above by providing local knowledge to each shot on every hole. 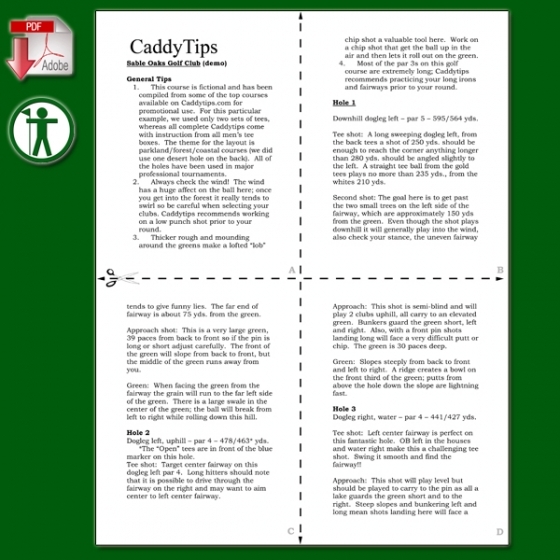 Caddytips are written guides that print on regular US letter size paper 8.5 x 11 inches and have cut lines that allow a golfer to create a quarter-page booklet 4.25 x 5.5 inches. Now the golfer has a convenient pocket-sized guide that will help them develop a course strategy and shoot better rounds. Caddytips are for golfers of all abilities whether you are a scratch golfer or a 30-handicap. What do Caddytips consist of? Caddytips contain important golf course information necessary for golfers to achieve the best results based on their skill level. Caddytips begin with the name of the specific course outlined and is followed by several General Tips. These Tips will help a golfer prepare better prior to their round. For instance, a course with several long par 3s would have a General Tip saying to practice your long irons prior to your round. Caddytips also include descriptions of each hole for the course listed above. Caddytips examines each hole, shot-by-shot and gives the golfer vital objective information. How do I download Caddytips? Caddytips offers an instant electronic delivery system once the checkout process has been complete. To download the Caddytips for the course listed above, please click the Download the Caddytips button. You will then be taken to a form that must be filled out in order to receive your Caddytips. After the form is completed, you will then be taken to a page that has your download information at the top. Click on this graphic or the course name and then you will be prompted to choose whether to open or save the document to your hard drive. Caddytips recommends saving the file to your hard drive so that you may create your own library of Caddytips.